Welcome to my website. I hope you enjoy looking at my work. Upcoming exhibitions: 'Here and There': This will be at Hilliers Arboretum at Romsey. It starts on Wednesday 5th October and finishes on Sunday 23rd October, 10.00am - 5.00pm each day (closing at 3.00pm on the last day). More details in the 'Exhibitions' section. To contact Kate telephone 01425 657115, or visit in person. 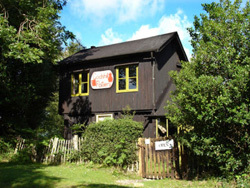 The Pottery is located in the New Forest with easy access and parking. We are 2 miles east of Fordingbridge on the the B3078, post code: SP6 2LN. Opening times for both the Pottery and Art Gallery are 10.00am until 5.00pm. Closed all day on Sundays. We set up the pottery in 1964 and are still busy working. You will find a wide range of traditional domestic earthenware. Kate's gallery shows a selection of her paintings, with much more in her chalet at the end of the garden.